Oil & Gas Blogs List. The Best Oil And Gas blogs from thousands of top Oil And Gas blogs in our index using search and social metrics. Data will be refreshed once a week. Oil And Gas newsletter is a comprehensive summary of the day's most important blog posts and news articles from the best Oil And Gas websites on the web, and delivered to your email inbox each morning. To subscribe, simply provide us with your email address. Houston About Blog The Oil & Gas Journal delivers the latest international Oil and Gas news; analysis of issues and events; practical technology for design, operation and maintenance; and important statistics on international markets and activity. Facebook fans 96,152. Twitter followers 194,213. Worldwide About Blog Rigzone is the world's largest online resource in oil and gas news, jobs, recruitment services, advertising, events, and data. If You are an industry proffesional, We connect you to the news you are looking for, the career opportunities you want, and the actionable insights and data needed to tackle any industry and career challenges that may come your way. Facebook fans 177,179. Twitter followers 93,548. Denver, CO About Blog Oil & Gas 360 is an investors single source for original oil and gas news, information, earnings and analysis. The best event calendar in the industry. Facebook fans 531. Twitter followers 1,565. Houston, TX About Blog OilandGasInvestor.com is your complete source for information about the financial world of oil and gas. Oil and Gas Investor is the information source that oil and gas executives turn to first for E&P activity and to analyze and interpret industry trends. We cover exclusive news, features, financings, E&P, drilling activity, people moves & industry conferences. Facebook fans 1,200. Twitter followers 11,521. Egypt About Blog Egypt Oil & Gas is the leading information provider for the Egyptian petroleum industry, offering a monthly publication, daily updates, concession maps, industry and analysis reports; in addition to major industry events. Facebook fans 11,387. Twitter followers 959. Mexico About Blog Oil & Gas Magazine is the news site of the hydrocarbons sector in Mexico, here you will find news of oil, Pemex, round one and energy reform. Facebook fans 21,611. Twitter followers 4,202. San Francisco, CA About Blog Reddit feed for Oil and Gas industry news. Facebook fans 1,090,589. Twitter followers 473,687. Mountain View, CA About Blog Comprehensive up-to-date news coverage on oil and gas indsutry, aggregated from sources all over the world by Google News. Facebook fans 22,387,914. Twitter followers 212,889. About Blog The web presence of Upstream, the international oil and gas newspaper. Upstream industry news as it happens. exclusive and independent news covering the entire upstream oil and gas industry in every corner of the globe. Facebook fans 1,570. Twitter followers 54,277. About Blog Latest news on oil prices, fracking, drilling, refining, and processing for gas by CNBC. Facebook fans 2,071,888. Twitter followers 2,605,631. About Blog Global Specialist in Energy Management and Automation providing information on Oil and Gas. Facebook fans 1,057,388. Twitter followers 6,449.
International About Blog Here you find an overview of the Oil & Gas saftey and risk methodology. Enhance knowledge sharing and inspire to drive the industry further in a safe and reliable direction. Facebook fans 14,259. Twitter followers 15,246. About Blog S&P Global Platts provides critical information for the commodities & energy markets to make physical commodity markets more transparent and efficient. Blog post provides information on oil sector. Facebook fans 6,824. Twitter followers 111,313. Johannesburg About Blog Latest news on energy sector, including, biofuels, liquified natural gas, pipelines, storage, refineries, retail and oils and gas. Facebook fans 4,511. Twitter followers 11,856. About Blog Get updated oil and gas news. We provide accurate data and energy news intelligence to a diverse audience across Africa and around the globe and industry professionals. Facebook fans 7,659. Twitter followers 913. Dulles, VA About Blog Daily natural gas news and price data from NGI - Natural Gas Intelligence, covering North American shale and conventional gas markets. News, analysis, price data--all in one place. Facebook fans 392. Twitter followers 9,448. Worldwide About Blog A great source for training news in the petroleum industry as well as information about PetroSkills courses, the PetroSkills Alliance, and technical pieces from our world-class instructors. Facebook fans 2,491. Twitter followers 1,318. Houston, TX About Blog RBN Energy is a fundamentals analytics company known for its energy markets consultancy. It provides market advisory services specializing in strategy, acquisitions and divestures for firms engaged in trading, marketing or purchasing of energy commodities, purchase and sale of energy related assets and E&P for oil and gas. Facebook fans 249. Twitter followers 1,387. About Blog The source for oil & gas news, activity, and information. BOEReport.com features: real-time news headlines, well activity map and data, property listings, commodity prices, economic releases, and industry jobs. Facebook fans 5,354. Twitter followers 3,191. About Blog Iraq Business News brings you the latest on developments and opportunities in the oil and gas industry in Iraq. Facebook fans 7,517. Twitter followers 363. About Blog Enform is the upstream oil and gas industry's advocate and leading resource for the continuous improvement of safety performance (training, resources, COR). Facebook fans 302. Twitter followers 1,072. Houston About Blog Blog post covers Oil News, Analysis & Technology. OE offers multiple ways to stay up-to-date on the latest technology and trends necessary to help you do your job. Facebook fans 4,664. Twitter followers 8,514. Brecksville, Ohio About Blog North American Oil & Gas Pipelines is the premier magazine covering oil & gas pipeline construction & maintenance. Published monthly by Benjamin Media Inc.
Facebook fans n/a. Twitter followers 2,148. Calgary, Canada About Blog EnergyNow is an online media service dedicated to delivering the latest energy news, data, and jobs to the Canadian oil and gas industry. Facebook fans 310. Twitter followers 2,159. Facebook fans 11,343. Twitter followers 4,928. About Blog Malcolm has over 30 years’ experience in the Oil & Gas sector and is a widely used media source. He often appears in print and on screen, and also writes an acclaimed daily blog read by much of the resources industry as well as investors both institutional and retail. Vancouver, Canada About Blog Finest independent news source and blog commentary on the North America Oil and Gas Industry. Its missio is to cover the technology revolution that is happening in the oil and gas industry. Facebook fans 1,182. Twitter followers 52,064. HOUSTON/NEW YORK About Blog Matt Smith's ClipperBlog at Clipper Data is just an amazing resource. Clipper Data uses Big Data and Big Data Analytics to provide insight into global crude and refined product movement and inventories, and the blog does a very good job of showing off the power of those insights. Facebook fans n/a. Twitter followers 5,197. London About Blog Exprodat provides GIS and information management solutions to the upstream oil and gas industry, blending GIS, IT, geoscience, and oil and gas industry expertise. They specialize in improving upstream petroleum E&P processes by helping oil and gas industry companies apply GIS technology. Facebook fans 385. Twitter followers 771. Canberra, Australia About Blog The Australian Petroleum Production & Exploration Association is the peak national body representing Australia’s oil and gas exploration and production industry. APPEA’s vision is to achieve a growing and internationally competitive Australian oil and gas industry that makes a vital and sustained contribution to the nation’s economy. Facebook fans 466. Twitter followers 4,018. About Blog Comprehensive Ghana Oil and Gas news, information, updates, analysis. Facebook fans 735. Twitter followers 3,058. About Blog Today's oil and gas industry can be rough to find work. We're here to change that, check out our website and find the right job for you today. Mission to be your number one spot for quality oilfield jobs. Facebook fans 102,700. Twitter followers 456. About Blog Latest Oil and Gas News from East Africa, Also hydrocarbon exploration, geothermal, drilling, discoveries, pipeline, wind and solar energy news. Also have a view of some of Production Sharing Agreements between governments in the region and various oil companies exploring for oil and gas. Facebook fans 1,050. Twitter followers 1,973. Austin, TX About Blog RigUp is the easiest way to work in oil and gas. Vendor discovery, ability to work with any vendor, job tracking in real time, hassle free invoicing. RigUp also offers a modern approach to consultants, cost effective oilfield goods and services, and data-driven project management. Facebook fans 306. Twitter followers 398. Dubai, UAE About Blog Oil Review Middle East is the region's leading oil and gas magazine that covers the exploration and production, upstream and downstream petroleum industry from the Gulf Corporation Council states and Iran to North Africa and the Caspian. Facebook fans n/a. Twitter followers 2,191. Australia About Blog Gas Today is the magazine for Australia's natural gas industry. Informing Australia's upstream and downstream natural gas industry about news, products, projects, developments, people, companies, technology and policy. Facebook fans 1,019. Twitter followers 10,285. Louisiana About Blog LOGA was organized in 1992 to represent the Independent and service sectors of the oil and gas industry in Louisiana; this representation includes exploration, production and oilfield services. Facebook fans 12,010. Twitter followers 25,215. Austin, TX About Blog Mr. McFarland represents land and mineral owners in oil, gas issues, in both transactional and litigation matters. About Blog SHALE brings opportunities for businesses by bringing them together and highlighting the contributions they make to oil and gas industry and our economy. Facebook fans 26,078. Twitter followers 4,548. San Antonio, TX About Blog SHALE brings opportunities for businesses by bringing them together and highlighting the contributions they make to oil and gas industry and our economy. Facebook fans 26,054. Twitter followers 745. Cracow, Poland About Blog The best student magazine about Oil & Gas industry. Inspiring and providing information for free. YoungPetro is edited by students designed especially for the Oil and Gas industry. Facebook fans 5,198. Twitter followers 1,131. Abilene, TX About Blog The Permian Basin Petroleum Association is a non-profit organization for the promotion of business efficiency and the betterment of Permian Basin oil business through cooperative efforts and the exchange of ideas. Facebook fans 9,843. Twitter followers 947. About Blog Headquartered in the Houston Area, Pickett Oilfield, LLC is an international buyer and seller of new, used and refurbished oil & gas drilling equipment. Tulsa About Blog Read the latest oil & gas news, oil exploration, offshore drilling & shale oil news from PennEnergy. Facebook fans 197,921. Twitter followers 49,876. Australia About Blog A blog for the Radial Drilling & Radial Jet Drilling industry. Facebook fans 9. Twitter followers 4. Houston, Texas USA About Blog I lead a small but dedicated team of industry professionals, with a laser focus on the intersection of the Oil and Gas industry and your revenue stream. We are the Oil and Gas sales experts. Facebook fans 190. Twitter followers 10,172. Plano, TX About Blog Oil and gas investment opportunities in Texas for quality drilling & income projects for industry, accredited, & institutional investors. Facebook fans 2,786. Twitter followers 2,057. Pittsburgh, PA / Global About Blog Shale Markets provides educational materials, blogs & comics from the O&G Industry. Our news site is a one stop shop for all news O&G. Don’t waste your time searching through several sites to stay current with the days events as they relate to the O&G Industry. Facebook fans 733. Twitter followers 18,145. Facebook fans n/a. Twitter followers 1,972. Tyler, TX About Blog SDS Petroleum Consultants provides Drilling and Completions engineering, Wellsite Supervisors and Project Management for the oil and gas industry. Facebook fans 4,794. Twitter followers 162. London, England About Blog A Smart Marketplace for Oil & Gas and Energy Infrastructure Projects. Facebook fans 130. Twitter followers 168. Anchorage About Blog News & Commentary on Alaska Oil, Gas & Fiscal Policy from Brad Keithley. Brad Keithley is a former business executive, lawyer and consultant with over 35 years experience working on oil, gas and fiscal issues. Facebook fans 7,599. Twitter followers 1,637. Austin, TX About Blog Articles and posts by experts in the oil and gas E&P industry. Read the latest news, information and insights from Drillinginfo on the DI blog. Facebook fans 84,693. Twitter followers 10,780. About Blog The Energy Law Blog published by Liskow & Lewis provides updates on oil and gas exploration, production, and drilling. Facebook fans 60. Twitter followers 204. St. John's, NL About Blog Gas and oil issues as they pertain to the Newfoundland & Labrador,and Canadian consumer. George Murphy keeps you informed of fuel pricing issues, making sure you're ahead of Big Oil's pricing curve! Facebook fans n/a. Twitter followers 7,223. About Blog Following what goes on with oil and gas exploitation in and around Adrian, Michigan since 2013 - and how these events in our little city connect to the global environmental situation with the occasional sidetrack to other related environmental issues in Lenawee county, Michigan and how those relate to global issues. About Blog The Aussie Oil and Gas Observer blog is a regular blog written by an industry observer based in Australia. It provides his very personal observations and analysis on week-daily developments in the oil and gas scene, viewed from an Australian perspective. Norway About Blog Scandinavian Oil-Gas Magazine is your premier source for in-depth information on developments within the oil & gas industry in the Northern Seas. With its broad scope, Scandinavian Oil-Gas Magazine provides you with a unique window to the global oil and gas industry in an era of continuing change and maturity in the industry. Facebook fans 1,222. Twitter followers 2,174. Montgomery County, Maryland About Blog This Oil and Gas Law blog offers news and other information about oil and gas indsutry law and regulations. Dubai, United Arab Emirates About Blog The new digital destination for Middle East energy professionals, and its associated magazines: Oil & Gas Middle East, Petrochemicals. Facebook fans 7,443. Twitter followers 5,880. London, UK About Blog We believe you need the best, most accurate and timely data to make quality decisions, and you deserve a system that is transparent, easy-to-use, fast and flexible. And we know it's important to continuously improve our product in response to market feedback. Houston, TX About Blog Oil & Gas Financial Journal provides financial decision makers with accessible and essential business intelligence regarding worldwide oilandgas markets. Our mission is to provide petroleum industry managers, analysts and investors credible, useful information about the most important financial developments of their business. Facebook fans 12,837. Twitter followers 38,622. About Blog Welcome and thank you for visiting our website! We are providing our customers with the finest and most cost effective patented solutions in the world for your “Piping Support” or corrosion mitigation needs. Check out this site to know more. Facebook fans 641. Twitter followers n/a. About Blog Oil & gas industry technology news, insights and opinions from Panasonic. Learn about the latest oil & gas technologies and trends. Facebook fans 51,326. Twitter followers 1,051. Vadodara, Gujarat, India About Blog The worldwide supplier of molecular sieve desiccant for industrial natural gases, liquids and oil drying solution for petrochemicals and other industries. Facebook fans 644. Twitter followers 141. Johannesburg, South Africa About Blog Oil Gas Africa is Focused on the African Petroleum industry Downstream & Upstream. Facebook fans 3,474. Twitter followers 4,483. About Blog Baker Donelson Focusing on making sense of the complex challlenges and recent legal developments affecting the energy industry. Facebook fans 1,031. Twitter followers 3,099. Dubai, UAE About Blog Pipeline Magazine delivers latest Oil, Gas and Energy news from Middle East and across the globe. Stay updated with the news through: articles, blogs, videos, project updates and interviews with movers and shakers of oil, gas and energy sector. Facebook fans 518. Twitter followers 7,974. About Blog Houston's daily must-read source for news and analysis on the oil, gas and energy business. Facebook fans 6,867. Twitter followers 13,323. 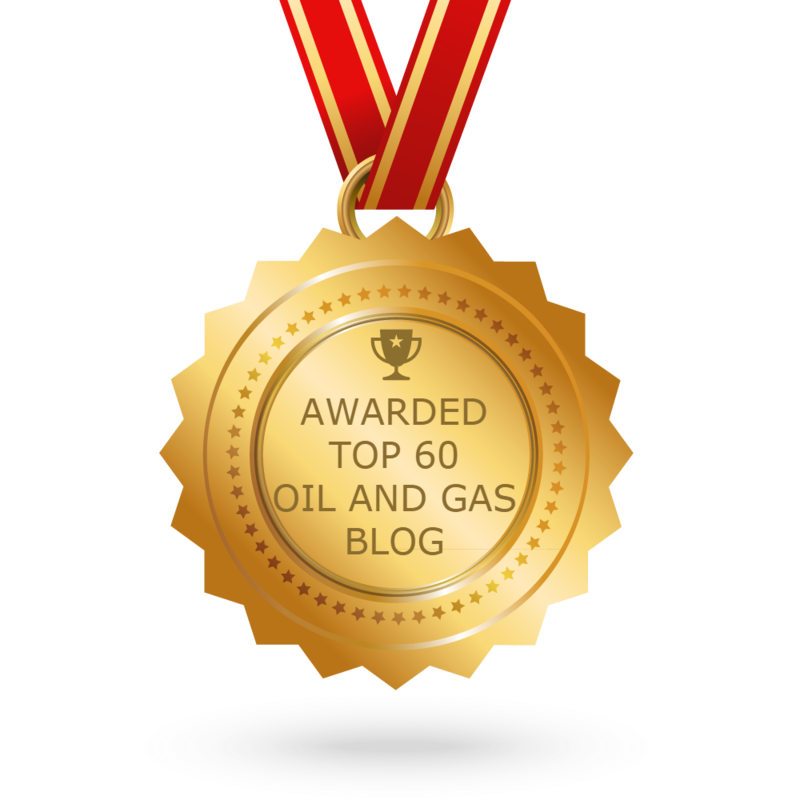 CONGRATULATIONS to every blogger that has made this Top Oil And Gas Blogs list! This is the most comprehensive list of best Oil And Gas blogs on the internet and I’m honoured to have you as part of this! I personally give you a high-five and want to thank you for your contribution to this world.